Incentives are little hints placed on product pages designed to create a sense of immediacy in the buying decision. Imagine a product going out of stock. Woocommerce by default displays how many units of the product are still in stock. Incentives extend this by also giving you the possibility to display how many other customers are currently viewing the product and at what time the product was last purchased. Additionally you can also display statistics like how often the product was purchased in the last 24 hours, in the last 7 days or how many units were sold in total. Displaying this information can either be done directly on the product on different positions or as a little notification box floating above your main site. 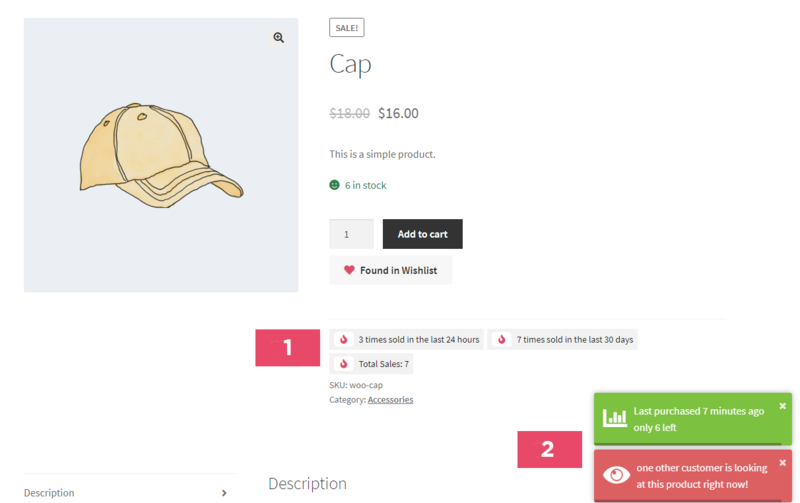 To start of lets look at what a product page with incentives could look like. Product statistics embedded directly on the page. Product statistics and incentives displayed as notifications. You can change the appearance, how incentives should be embedded as well as when to show them. Its possible to set threshold values in the admin settings. This enables you for example to only display the 24 sales stats if more then a specified number of units have been sold. There are a lot of additional configurations you can make, so lets go over them. Here is a picture of the admin page for incentives. Disable this checkbox to not show any incentives on your products. You can also disable incentives on a per product basis. 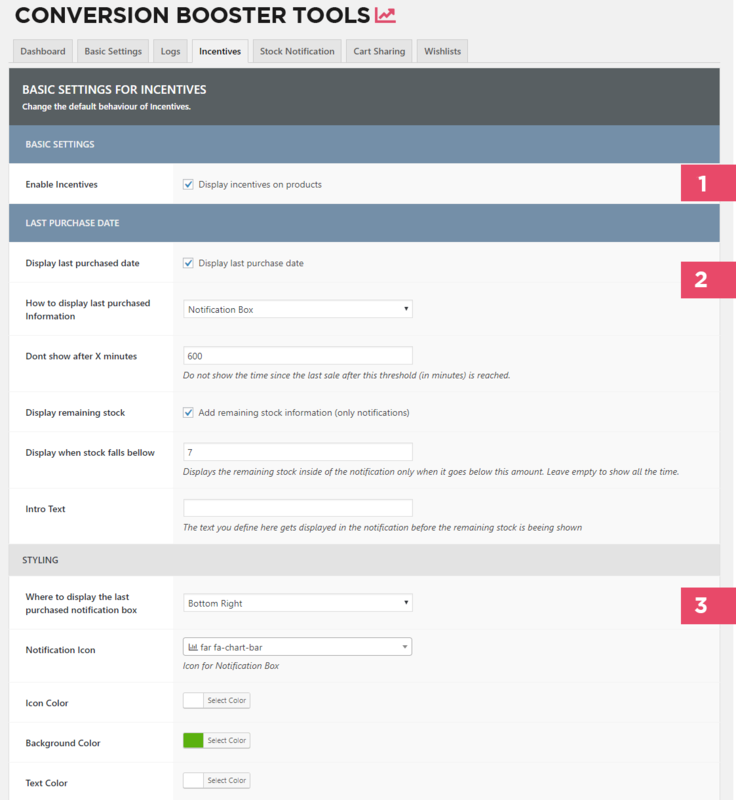 These settings are located directly in the product editor page under the tab „Conversion Boost“. All incentives feature about the same amount of settings. You can disable a type of incentive, in case of 2 you can choose to not show the time of the last purchase. Right under that setting you find the option to change the display style. Here you will find several options. If you choose „Notification Box“ the information of the incentive will be displayed in a little notification box that is hovering above your site. Alternatively you can choose to embed the information directly on the page on several different points. Changing this option will also either hide or show different styling settings. Choose „Notification Box“ as the preferred display style and the style settings for onpage elements will be hidden. „Don’t show after X minutes„: Don’t show the time since the last purchase after the amount of time in minutes specified in this box. „Display remaining stock„: You can couple the last purchased date information with an information about the remaining stock. „Intro Text„: Optionally display text in front of the generated text. This can be used to add a personal touch to the message. Depending on how you want an incentive to be displayed you will find different styling settings bellow each detail settings. If you choose to display the incentive as a notification you can choose where the notification box should be displayed. Each notification is also able to display an icon. Bellow that you can change the colors for the notification box. Simply click on each „Select Color“ field and choose the color that best suits your theme. Keep in mind that each color will get a little filter in the display process, simply check out the notification on your frontend to see what the results of your changes look like. Enabling this section will display an information box on your product pages if more then one person is currently viewing the same product. As usual you can choose to display this information directly on the product page or in a notification box. One extra setting you find here is the amount of time a visitor can be inactive before he will no longer be counted as beeing activly viewing a product. Database records of visitors get cleaned up on a hourly basis. Depending on the display style you choose under „How to display current visitor count“ you get different styling settings. Each have the option for a custom FontAwesome icon an basic display colors. 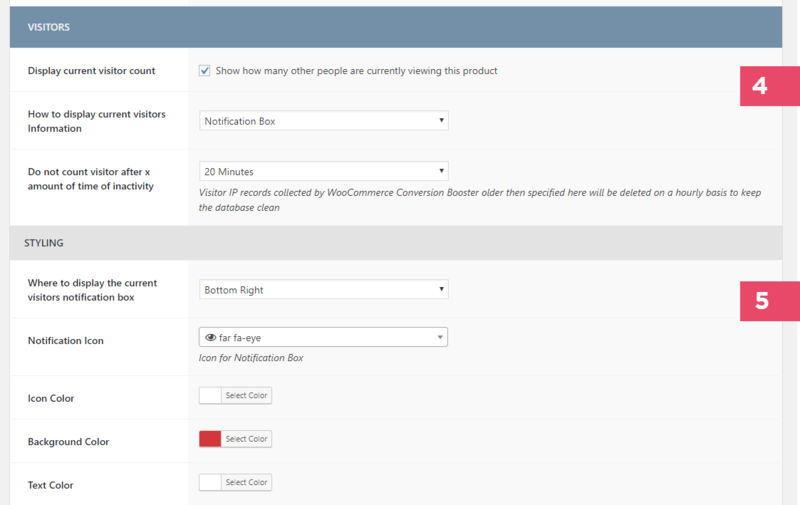 Display sales statistics on your product pages. You can choose to globally deactivate sales stats with the Checkbox called „Activate Sales Stats“. Right under that you can choose where you want to display this information. 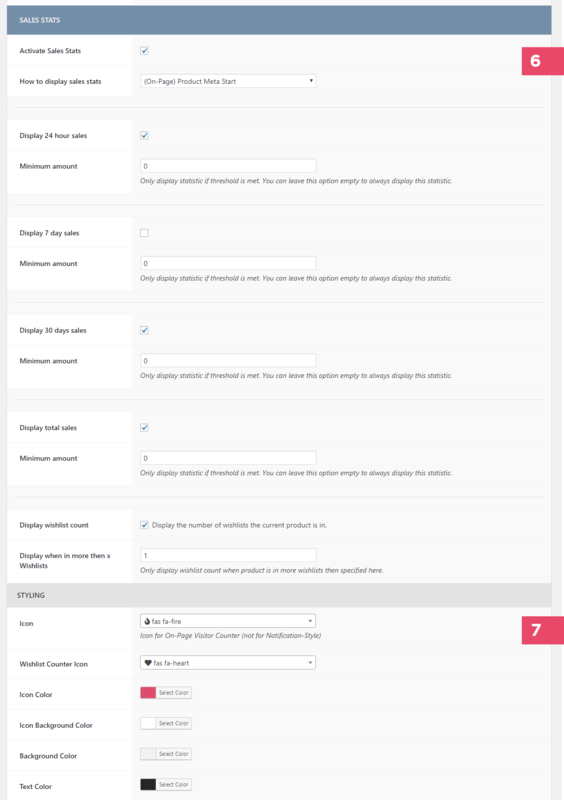 Each statistic comes with an extra checkbox that activates it as well as a minimum threshold that needs to be met before beeing displayed on the frontend. Lets look at the „Display 24 hour sales“ setting. If you choose to display this statistic you can set a „Minimum amount“. The amount of solt units in the last 24 hours will then only be displayed if amount specified here is greater or equal to the minimum amount. This helps if you only want to display sales statistics on products that are in high demand. You will find the same settings for each other statistic like the 7 day sales stat or the total sales count. Right at the end of the list of statistical incentives you also find a setting in combination with the wishlist feature that comes with plugin. Displaying the amount of wishlists a product is in can be a good incentive for customers because they see that other people like that specific product too. Change the look and feel of the incentive on your frontend. 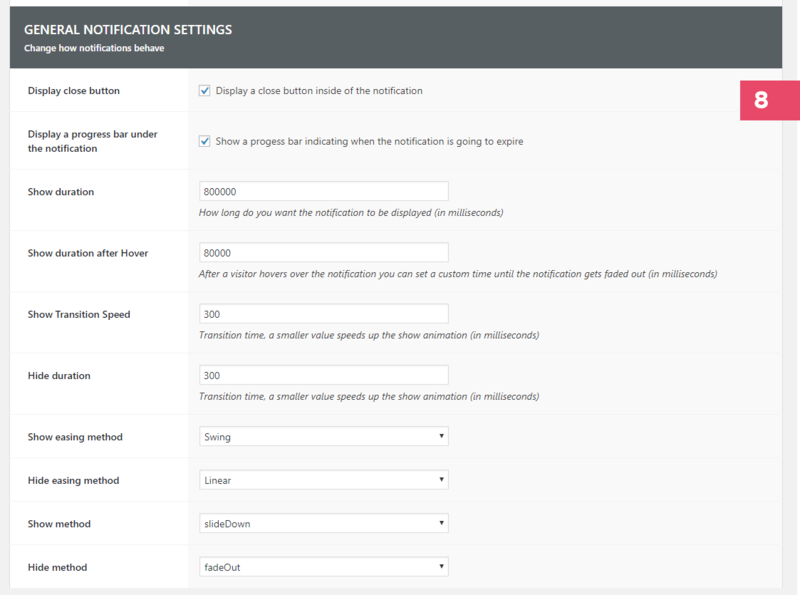 At the bottom of the incentive options you find some detailed settings for your notification boxes. You can change how long you want the notifications to be displayed, the way they should fade in on your site, wheter you want them to display a close button and so on. You can play around with these settings. Changes will be visible on the frontend as soon as you click the save button at the bottom of the page.